Guess what is less photogenic than Sloth from the Goonies? But guess what is just as wonderful and lovely as Sloth? Remember, he had a big heart and was just misunderstood. It may not be the belle of the soup ball like lobster bisque or vegetable soup. But what it lacks in beauty and appearance it makes up for in flavor. Yes, I think soups can be pretty. 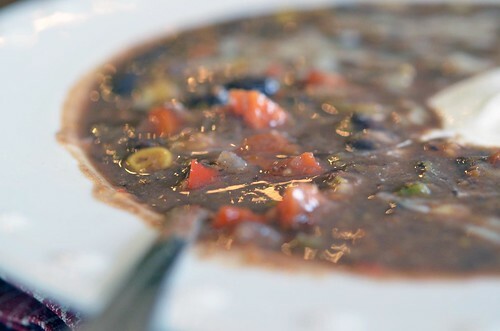 But black bean soup just doesn’t look pretty. Its the ugly duck of the soup world without ever getting the chance of turning into the swan. 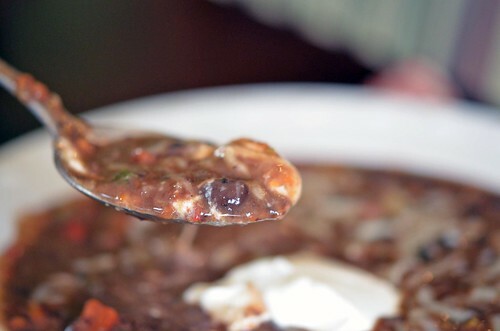 Poor poor poor black bean soup. I like dishing mine up with a dollop of sour cream and a bit of shredded cheese. 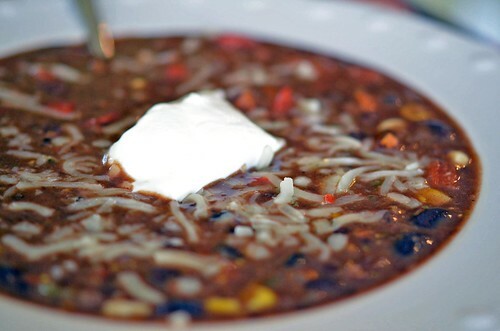 Do you like sour cream in your soups or chili? I do. I love it. I like to keep the dollop a dollop and slowly nibble away at it with each spoonful of soup…but then towards the end I give in and swirl it all together, making it all creamy and good. Sigh…so good, so very good. 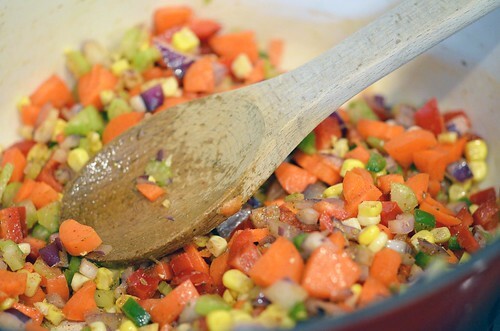 Cook vegetables with spices until tender. What a colorful thing we have going on here. 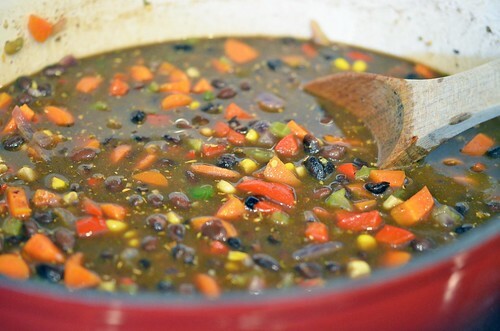 Add in the beans and stock…looking like soup now! That is a lot of beans and vegetables. Add the purreed soup back into the pot. See it doesn’t look all that lovely anymore. But the taste and aroma…oh its heaven. In a stockpot, heat olive oil over medium-high heat. 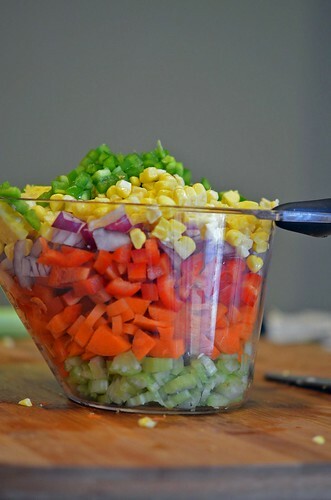 Add celery, carrots, red pepper, onion, jalapeno, corn, and salt, oregano, chili powder, and cumin; saute for 7 to 10 minutes or until vegetables are tender. During the last minute, add the minced garlic. Stir occasionally while vegetables are cooking. 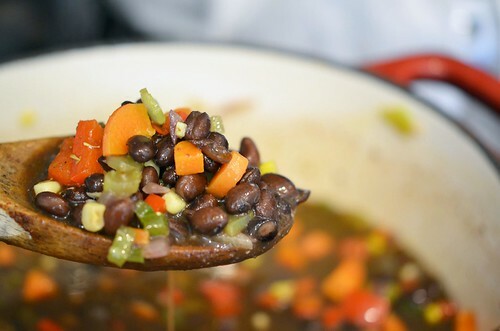 Once vegetables are tender, add beans. Rinse each can out with a little bit of the chicken stock/water and add to the stock pot. Add remaining stock/water to pot. 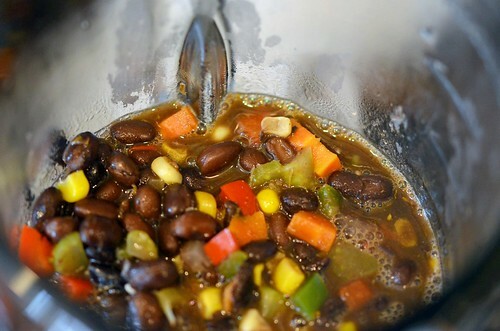 Bring soup to a simmer over medium heat. 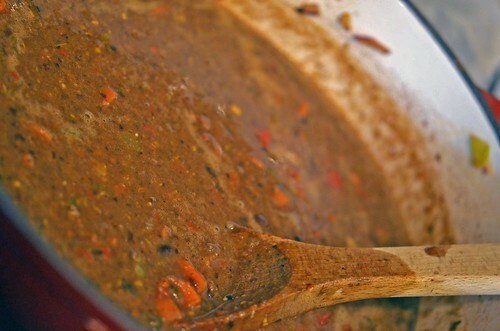 Once simmering, laddle out 2 to 3 cups of soup and place in blender. Puree until smooth. Add back to stock pot and stir. Simmer for another 10 to 15 minutes. Serve and garnish with sour cream and cheese.